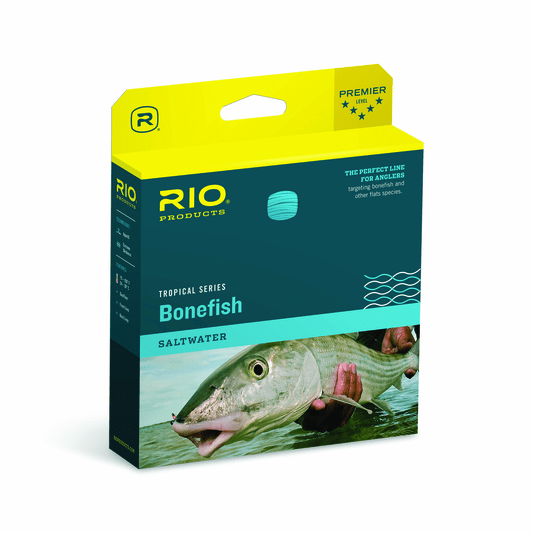 Description The Rio Bonefish Quickshooter Tropical is an new line for 2013, offering advantages to first-time and expert anglers when a very short head is an advantage for quick rod loading and close, accurate casting is the order of the day. 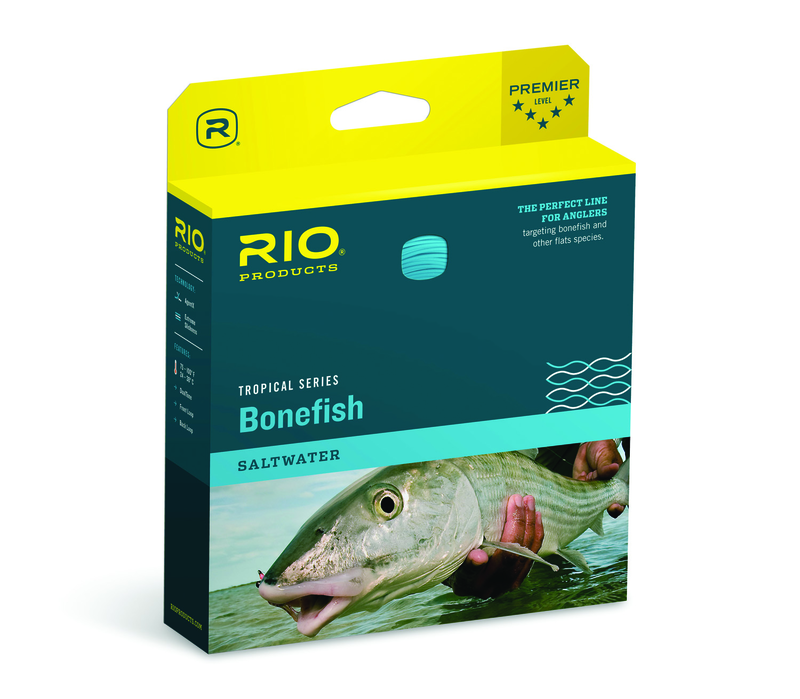 The short powerful head, teamed up with Rio's technically superior Tropical line coatings make the Bonefish Quickshooter an excellent for flats fishing where the bones could be at rod's tip or 30 feet over your shoulder. Guide Reviews, Video, and Sales on Rio Bonefish Quickshooter Tropical Fly Lines: Rio's answer to the challenge of achieving sufficient rod loading with very little line, making lightning accurate casts at close range. Flats anglers may face situations where change of direction casts, close range presentations, and pin-point accuracy are at the top of the daily menu. These conditions call for a fly line that can load a rod quickly and zap a fly on the fish's nose without a lot of fancy false casts. These Bonefish Quickshooter fly lines are new for 2013 and will get the job done nicely. Most Unique feature: The 35.5' shooting head starkly distinguishes this fly line as the most aggressive among the Bonefish tropical specialty fly lines and is a great choice for achieving easy rod loading and executing quick, accurate casts. Line Taper: This Bonefish Quickshooter Tropical line has an abbreviated powerful head taper that loads rods quickly, shoots well, and is suited to change of direction casts to spooky or finicky fish. PLEASE NOTE the line taper insert chart above. Sink rate: N/A. This line is offered as a full floater. Line Core: Moderate stiffness to maintain body integrity in tropical heat. 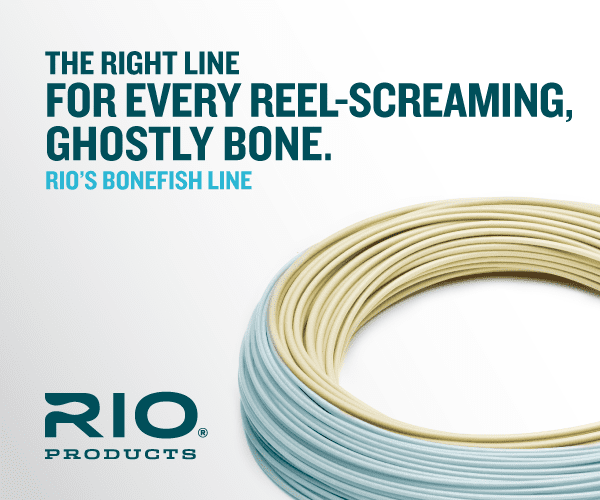 Line weights available: the Rio Bonefish Quickshooter Tropical line is available in line wts. 7-9. Overall/Head Length: Approximately 100'/35.5' at all line wts. Line Color: Aqua blue/Sand or High-Vis Orange/Sand. Line floating properties: The Bonefish Quickshooter Tropical lines incorporate Rio's Agent X and are super slick under tropical fishing conditions to enhance shooting ability. Welded Loops: The front and back ends of Bonefish Quickshooter Tropical fly lines deliver welded loops to ease the process of quick rigging to attaching leaders.